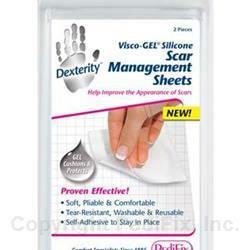 Self-adhesive Silicone sheets smooth, soften, and improve the texture, color and thickness of scars. Help relieve itching and pain. Washable and reusable for repeated applications. Soft, pliable, comfortable. Cost effective, easy to use and durable. 2.5” x 3” sheets, 2 sheets per pack.